As part of my planned display board for the United States Marine Corps army that I’ve been working on for Bolt Action, I purchased several landing craft from Sarissa Precision. I purchased two of their Higgins landing craft (designed for personnel) and one of the LCM-3 landing craft (Landing Craft Mechanized, for hauling vehicles around). 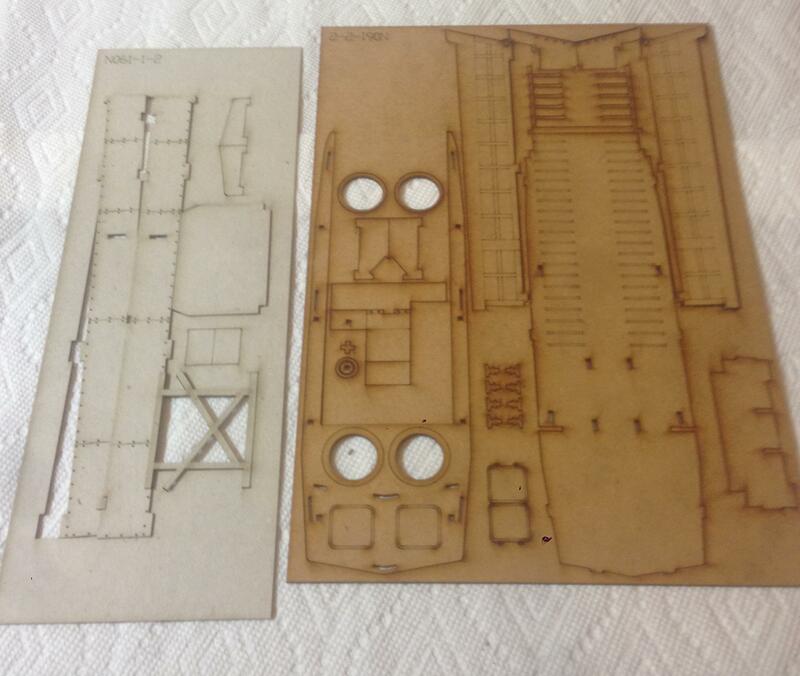 Sarissa makes a wide range of laser cut MDF (medium-density fiberboard) terrain, as well as a few vehicles and boats, that can be used in many different game systems. For the most part their products seem fairly easy to put together and they look solid when painted up. For the purposes of this review, I’m looking specifically at the landing craft. For a look at their Far East building sets, check out Andrew’s impressions. The Higgins craft is the smaller of the two kits, and also slightly easier to put together. Both the Higgins and the LCM are combination kits using laser cut MDF and greyboard. The MDF pieces were fairly easy to get out of the frame in most sections, except for in one place that I had trouble. The interior section of the front ramp is a thin piece and I accidentally snapped one of the sides off trying to remove it from the MDF sheet. Fortunately I was able to work with it a bit and get it back into position once everything was connected to the rest of the ramp. Other than that ramp section, all the MDF goes together quite well. The outer hull of the boat is made of the thinner greyboard wrapped around the MDF framework and has details such as rivets etched into it (as does the MDF). The greyboard is both a blessing and a curse. They are able to put some nice detail into it, and the design allows it to wrap around the hull very well. But the thin aspect of it means that you have to be cautious as you attach it, as some of the connection points may bend or fold over, especially once they’re a little wet from superglue application. The LCM is a larger hull than the Higgins boat, understandably since it’s supposed to haul tanks around. The MDF frame on this one came out quite well, and while you still have to be slightly careful with the ramp sections it’s got a bit more strength to it than the Higgins ramp does. As with the other one, the MDF fits together perfectly and then you have to add the greyboard wrap around the hull. On this one they require a bit more bending of the greyboard as you work with it, and I found that at the back of the boat the boards didn’t quite wrap around far enough to fit flush, so I had to do some work to fill in a gap between the hull plates. It didn’t come out perfectly, but as that section will be mostly submerged once it’s in the display board, I wasn’t too worried about it. The drivers house also was made of greyboard, but it was able to fold into shape fairly well. The design leaves it open-topped for the pilothouse, but as I didn’t have a good model to throw in there as a driver I decided that I would create a roof for it out of the leftover greyboard and attached it on top. Both hulls look great and were easy to put together, I only spent maybe 20 minutes on assembly for each one. One of the big downsides to these Sarissa MDF variants as opposed to some of the plastic and/or resin versions that I’ve seen made by other companies is that these ones have no crew and no weaponry included. On the Higgins boat in particular, the drivers compartment is open and the pair of open circles near the back are meant to hold gunners with pintle-mounted machine guns. There are some models that will fit the bill available from Warlord Games, at least for the gunners, but I haven’t yet figured out what I’ll use for the pilot. I’m waiting for my new airbrush to arrive before I begin painting them, as I much prefer airbrushing vehicles. I’ll add some pictures of the finished products to the end of this review once they are complete (as well as including them in upcoming WIP/army update posts both here and on Instagram and Imgur.